A charter school is a public school that receives public funding to operate following the approval of its charter petition. Charter schools enjoy certain instructional and operational freedoms in exchange for increased accountability for performance. Who can develop a charter school? Successful charter schools have been initiated by surprisingly diverse developers, not just educators but also philanthropists, parents, community organizations, and other concerned citizens wanting to make a difference for children. Ultimately, strong developers will have a sound educational vision and the capacity to unite a team that has the expertise to skillfully implement that vision. This means depth of instructional expertise and the ability to build a school culture that helps educators and students thrive. A successful team also has the managerial experience to lead for a shared vision and the knowledge base to implement sound operations, finance, and school governance—all things for which CSDC can provide assistance (see more below). To whom do California charter developers submit their charter petitions for approval? In California, charter developers generally first submit their petitions to their local school districts. If a charter developer’s petition is denied by the local school district, the developer may appeal to the county office of education and, if denied there, to the State Board of Education. How many charter schools have been granted in California? Since the passage of California’s first charter school law in 1992, over 1,800 charter schools have been granted in the state of California. Approximately 1,400 of these schools are operating today. To learn about charter schools in your area, search the California Department of Education’s helpful directory of California charters by county. Start Smart provides a thorough overview of the charter development process. The presentation aims to supplement nuts-and-bolts factual content with insightful perspectives on what can be a challenging process. Start Smart is available online or in-person. The online presentation addresses the above content in about 90 slides, with audio recordings totaling nearly an hour and a half in length. The viewer controls the pace. Register below. The in-person version is available at CSDC's annual Charter Schools Leadership Update Conference held each fall. The in-person version provides added discussion, opportunities to network with other school developers, operators, and service providers, and the ability to attend numerous other sessions and workshops. Learn more. Having difficulty viewing Start Smart? Please see the “Tech Specs" section farther below or contact CSDC. Already registered but lost your confirmation email? There's no need to re-register. Please contact CSDC for your link to the workshop. 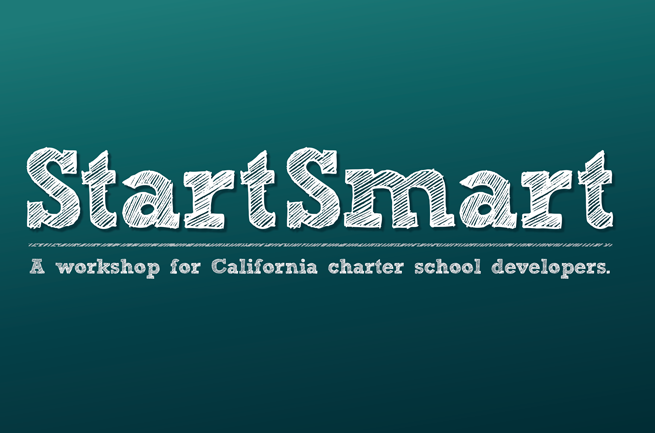 The next in-person Start Smart workshop will be presented at CSDC's annual statewide charter conference on December 10-11, 2018 at the Marriott Marquis San Francisco. The best CSDC event for developers to attend is our annual California conference, the Charter Schools Leadership Update Conference, which will be held this year on November 16-17 at the Manchester Grand Hyatt in San Diego, CA. In addition to a comprehensive, 3.5-hour update on the latest fiscal and policy developments, this conference also features workshops, breakout sessions, and structured networking. For many school leaders, this is a must-attend event every year, to ensure they stay up to date with the latest changes and trends. Once your school has secured approval, you might also consider attending our annual Charter Schools Leadership Institute or Charter Business Officer Training Program. CSDC’s Sample Charter School Governing Board Policies is one of the most strategic publications for a new school developer. The Sample Policies provide a customizable template of key school policies. The policies have been vetted for legal and practical considerations. Before you get started with the online version of Start Smart, you might first review the following tech specs.